The mission of the Institute of Local Self Reliance (ILSR) is to provide innovative strategies, working models and timely information to support environmentally sound and equitable community development. ILSR works with citizens, activists, policymakers and entrepreneurs to design systems, policies and enterprises that meet local or regional needs; to maximize human, material, natural and financial resources; and to ensure that the benefits of these systems and resources accrue to all local citizens. Mr. John Farrell, senior researcher, focuses on aspects of community control of energy through the “New Rules Project” at ILSR which was started back in 1998. The New Rules Project brings fresh new policy solutions to communities and states to ensure that they are “designing rules as if community matters.” Mr. Farrell’s work has included studies on community solar power, energy self-reliance, the costs of nuclear power, and feed-in-tariffs. He is currently focusing on the job creation possibilities being driven by the feed-in-tariff policies in Ontario, Canada. 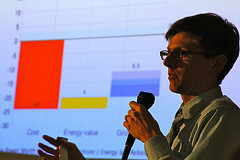 John Farrell is a senior researcher on the New Rules Project at the Institute for Local Self-Reliance, where he examines the benefits of local ownership and dispersed generation of renewable energy. His latest paper – “Maximizing Jobs From Clean Energy: Ontario’s ‘Buy Local’ Policy” – looks at the 43,000 jobs and 5,000 MW of clean energy scheduled under Ontario’s recent feed-in tariff program. He’s also the author of the second and expanded edition of Energy Self Reliant States, illustrating the potential for every state to meet their renewable energy goals with in-state renewable energy sources.